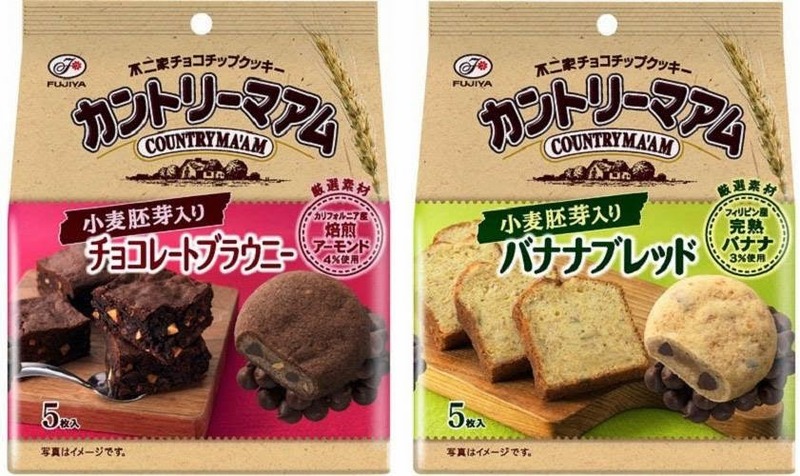 Country Ma'am is releasing two new flavors, one of which is a bit on the unusual side for Japan. The web site mentions that "banana bread" is "like pound cake" in the U.S. That's not quite right, and it actually is irrelevant to the cookies, but the fact that they feel it is necessary to explain that shows just how unusual banana bread is in Japan. It's not strange to find the occasional "banana cake" or muffin, but not "bread". The promotional material tells us that the banana version is made with Philippine bananas and has the smell of wheat. The brownie version boasts California almonds and, again, the promotional material asserts that mixing nuts in brownies is an American thing. If you've never had Country Ma'am cookies, they're known for being crispy on the outside and a bit soft and fudge-like on the inside. If you pop them in a microwave for a short time, then they heat up as something akin to a fresh-baked cookie... or akin to a freshly baked mass-manufactured shelf-stable cookie. They're actually pretty good and occupy a unique niche in the Japanese market. These two varieties are sold currently in small five-packs. My guess is that they are most easily located in convenience stores and I'm unlikely to encounter either variety at Japanese markets here. If I find one though, I might give it a try.